Modern day Huckleberry Finn-style adventurers on the Mississippi, Ryan (left) and Phillip take a break from their 2,300 mile kayak trip to snack on watermelon just north of Memphis. Mark Twain’s famous book, “Adventures of Huckleberry Finn,” tells of Huck stealing a watermelon – Ryan and Phillip were given theirs by a farmer who lives on the river. “Hey, Phillip, let’s take a boat trip down the entire length of the Mississippi River!” So began a remarkable Huck Finn-style river voyage by two self- described adventurers, travelers, and videographers. Ryan Jeanes’ casual remark to his business partner, Phillip Hullquist, planted the seed that grew into the duo’s three month odyssey from one end of America’s most iconic river to the other — a 2,300 mile river adventure from the Mississippi’s headwaters in Minnesota to its mouth in the Gulf of Mexico…and resulted in their full length documentary movie, “The River is Life”. Ryan paddles while Phillip (not shown) shoots video on their first day on the Mississippi River about two miles from its headwaters. The water’s only six inches deep there – nothing like what you expect in the Mighty Mississippi. Ryan and Phillip have made a boating adventure film that’s an engaging, watchable, and very interesting film about America. “It’s hard to imagine who wouldn’t enjoy this sweet, terrifically amiable documentary,” writes Mike Schulz in the River Cities’ Reader, a newspaper serving five cities along the upper Mississippi. Business-and-adventure partners Phillip (left) and Ryan (right) at the Mississippi River headwaters in Lake Itasca, Minnesota about to embark on a 2,300 mile journey in Sea Eagle kayaks. Experimenting with various loading arrangements, they found their best plan was to ride and paddle in tandem in one 380x while towing their boatload of gear behind them in the second kayak. 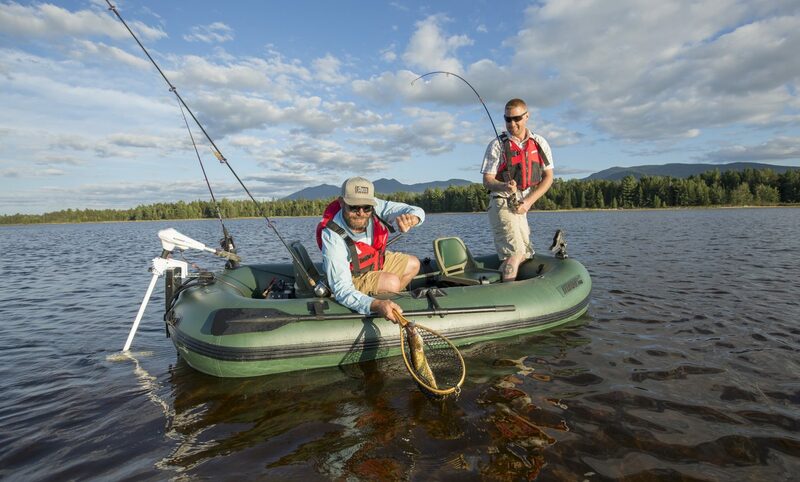 Sea Eagle’s Explorer Kayaks are the kayak-of-choice for serious adventurers. Watch Sea Eagle owner, Ted Pasternak, navigate white water rapids in his Sea Eagle 420x Explorer Kayak. ARE WE HAVING FUN YET? You have to be ready for anything on an extended kayaking trip. The 380x’s stability was much appreciated by Phillip and Ryan when storms hit near Natchez, Mississippi. What’s next for this pair of video camera-toting adventurers? “I want to try white water kayaking,” said Ryan. His passing comment, like “Let’s boat the Mississippi,” may be the start of a new adventure documentary film. Watch for it at a movie theater near you! What an adventure! Looking forward to the movie. Would love to see a movie re: your trip. Recently I came across some great articles on your site. The other day, I was discussing (http://blog.seaeagle.com/2012/04/04/kayaking-2300-miles-on-the-mighty-mississippi-they-boated-every-inch-of-americas-most-famous-river/ ) with my colleagues and they suggested I submit an article of my own. Your site is just perfect for what I have written! Would it be ok to submit the article? It is free of charge, of course! Really enjoyed your writing and was feeling as if I am with you. Please upload some videos. I want to do that but I can not find anyone who is crazy enough to join me. Can I do that by myself? Milenko, Don’t wait to long (like me) start small like the Hudson from Albany to NYC. Milenko: I read a book a few years back about a man that did it in a regular canoe by hisself. If I find the book I’ll drop the name. Found it. Mississippi Solo: A River Quest by Eddy Harris. Ryan and Phillip, where all ya’ll now, How can I get in touch with you? I’d be happy to talk about our trip and our experiences with the Explorer kayaks both on the Mississippi and on subsequent adventures in the years since. Can you contact us at staff@seaeagle.com and we’ll get Ryan’s contact info to you.